THE large end section of Class 47 No. 47738, used for educational purposes at Plymouth, was removed from the Regional Interactive Safety Centre (RISC) building on November 2 (RM Dec, p82). This building, next to the station, had been converted from the old Royal Mail docking station and contained various rail-themed scenarios for training staff in real-life situations. The loco section was used for emergency response training for when someone had been hit by a train. A false tunnel was built around the loco and it was also used for schoolchildren’s safety education, while trainees had used it for practising emergency loco-to-HST couplings without needing to call on operational locos. The RISC building is being demolished to make way for a multi-storey car park for GWR. The loco section, including a bogie, was extricated by Railway Support Services, (RSS), calling for the cutting out of a section of track and the positioning of a specially fabricated jacking frame. The ‘loco’ was drawn onto the frame, turned through 90 degrees using skates, and moved through the roller shutter doors and onto a low-loader. 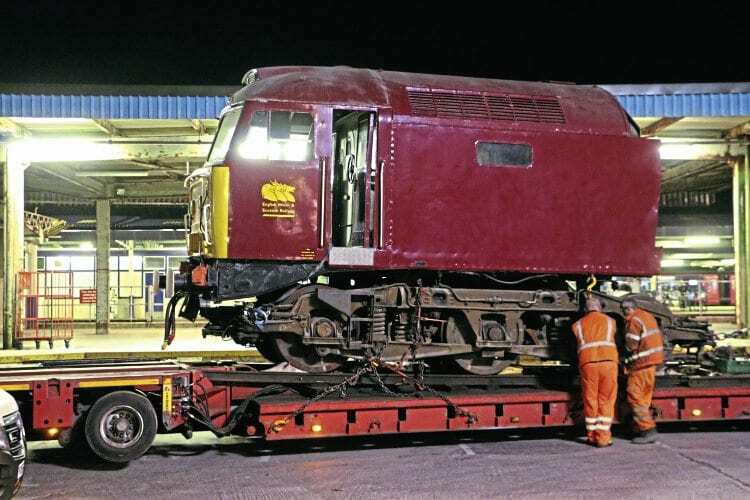 The loco section was taken to RSS in the West Midlands for the body to be lifted off the bogie.